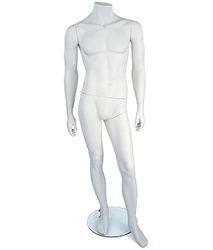 Male Headless Mannequin in white or tan fiberglass. Straight on pose with left arm bent. 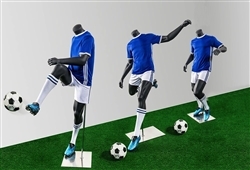 Nice Headless Male Mannequin with left arm bent pose. Good to use with basic strait arms down male mannequin to give your grouping some pizazza. * Height: 66" * Chest: 37" * Waist: 32" * Hip: 36" Available in White and Tan. Fiberglass construction. Round chrome based included with calf support rod.